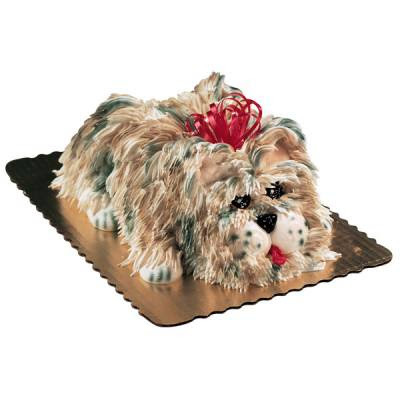 For some reason canine cakes seem to be all the rage these days, particularly in grocery-store bakeries. Now, I don't want to get down on these decorators too much, considering that a) they are usually over-worked and under-trained, and b) they outnumber me significantly. That said, you'd think that whoever was in charge of this kind of thing would have known that these doggy designs were a little, shall we say, beyond this group's collective skill set? Niiice. See, you can tell it's the exact same cake you ordered, 'cuz it has that red loopy bow sticking out of its head. I particularly like the oozing eye. Plus, that red "collar" looks a lot more like a gushing cranial wound - ditto for the "tongue". But it still looks more like a dirty mop-head with a face drawn on than a dog. Where are the legs? The ears? The neck? Also, if you're going to have a cake like this, why oh why would you stick candles in the poor pooch's back? He looks like he's been the target of sky-diving archers. Also in vogue are the tiny cupcake pups, ala Miss Love-You-1.000-Time. These are already wrecktastic in concept, given that there are only 2 cupcakes underneath the deluge of frosting, but the execution just makes 'em that much better. Check back tomorrow for those; this post is officially "to be continued"! Many thanks to Fawn R. & Monique R. for submitting the "dogs". Ack, and the candles coming out of it's back make it look so tortured. It might be just me, but I would find it creepy to eat a cake that looks just like my dog. I'm a big fan of the phrase "gushing cranial wound." Rolls right off the tongue. Oh, how I look forward to your witty banter every morning. I looked at the first picture, and while I didn't like it all that much, thought it wasn't a bad rendition of a dog. Then I saw what the cakes actually looked like (and of course, your description of them) and I had to cup my hand over my mouth as I laughed out loud in my cubicle! Maybe that first guy was just struggling because someone had hidden his airbrush? But still - having the dog spitting blood from which you write the text? Not good. The second cake reminds me of the trash heap from Fraggle Rock that lived in the backyard of The Gorgs. I think I'd say dusty mop more than dog. Yuck! Your blog is awesome. The pictures aren't as funny (more like scary)as your commentary on them. You rock, like the hand of one of these cake decorators. Seriously, it's right up there with eating the baby! I refuse to make one, it's just not right! Especially when done so wrong! OK, that first one there looks like the poor pup is vomiting the words 'Happy Birthday' in blood. That is one unhealthy pooch! The second one? Well, if you're a cake decorator, and it's going that badly, why, oh why, would you bust out the air brush!!! Oh LORD! Just so you know, viewing the daily wreck has become an event for my entire laboratory! Science breaks for Cake Wrecks! Great blog! These remind me of one of my fave childhood movies, The Wizard of Oz. No, not because they remind me of Toto. When I saw them I distinctly heard a cackly voice going, "Ahhhh, look what you've done, I'm melting, ahhhhh"
Anyone who would order this cake based on the "model" photo deserves what they get. It looks like it's growing mold. 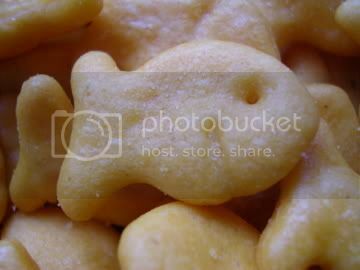 When I scrolled down to the wreck, I thought it was a cat, and thought they totally had it so wrong. Well, they did. I know I am rather judgmental on these types of cakes even if well executed; I just don't think I like cakes to try to look like the real thing they are depicting. Cartoon dogs, okay; realistic, not okay. Can't wait for tomorrows presentation! 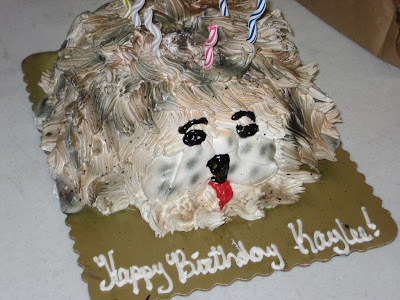 I've got to say the original dog cake kind of freaks me out too just because the hair looks so...hair like? I have no urge to eat a fuzzy cake. But yeah that third cake looks EXACTLY like the nasty old kitchen mop I found left in one of the apartments I lived in in college. Same shade of gray, same dubious contents. And now i'm bummed i didn't order this cake from Publix. I must admit i was surprised to see it in their book. Maybe i'll have to order it just to see what i get for the next party I throw. *sharp intake of breath* That first one (if you'll pardon the pun) takes the cake! As for the second one - why not a big mop-handle candle in the middle? Made my day, as usual! I think the second one only looks better because its a little more abstract and doesnt appear to be bleeding! I think the original (while well done) is creepy!! I don't think these are all that bad as renditions of the "model." Not great, but only just barely wrecks. Especially if you give the first one the benefit of the doubt and assume they don't have an airbrush there -- the plain brown icing was a better option than trying to match the airbrushed version in that case. And its shape and fur texture are better than on the second one. The eyes are scary though. Really I think the source of the problem with these is the model. It just isn't a very attractive cake to begin with, so even well-done copies are guaranteed not to be too attractive. And the bow bothers me because it's probably on a pick. It is too reminiscent of... you know, I'm not even going there. Instead I'll go the second place it reminds me of, which is the alien-ice-pick-killings in The X-Files. Not an image I want in the cake context. How the heck do they do that "fur" texture? I think that first one is a "Deepest Condolences For Backing Over Mr. Snuffles" cake. It looks like the tongue is spelling "Happy Birthday." Ew. I think this is halarious!!! The doggy cake picture that you ordered from was really good. I don't see how you could expect anyone to make it that way anyways. You are right in the fact that the red collar and the tounge look like ozing wombs. This blog is so funny. Good descritions! Oh, bless your heart. I discovered this blog a few weeks ago and use the RSS feed as a certified morning laugh. Today definitely did not disappoint. Do they have a SPCA – Society for the Prevention of Cake Abuse? Your blog has convinced me I must try to decorate a cake with fondant. After all, it cannot be as bad as some of the ones shown! I have issues with people wanting to eat replicated pets. There is something just so wrong about cutting up and serving Fluffy to all your friends. That original picture looks very much like a computer rendering - not an actual photograph of a cake. Talk about misleading. I can't bear to think of eating any cake that looks like an animal. There have been so many times that I have been jonesing for a cupcake but all they have are cupcakes with dog heads on them. 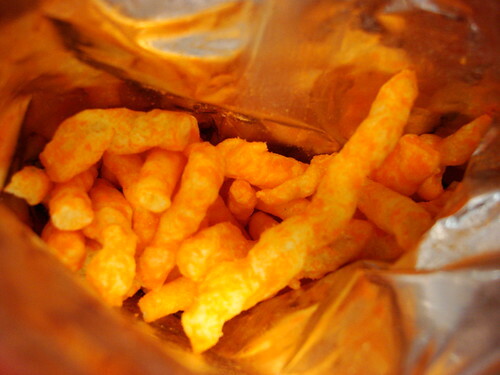 It is a major turn-off. You really have a knack for description. I sit at work and read your blog, and crack up, and people walk by and are like, why are you laughing at pictures of cakes? 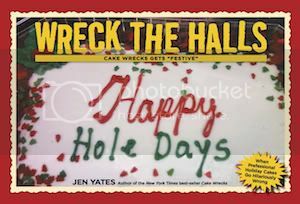 It should also be noted that the blood oozing from wreck #1's mouth actually spells "Happy Birthay"
:sigh: The cake tasted great but we had to dig it out from underneath about a gallon of icing! OMG!! RecoveringActor! Get out of my head! That is exactly what I was thinking! Not many people would automatically go to Fraggles when looking at those cakes. I feel like that first cake is "unique" to where there's no way someone could actually replica that. And I think someone is wrong with the asker to actually ask a grocery store bakery to make a cake like that and expect it to look exactly like the original. Normally you notice all the tiny details that go into the complete wreckitude of a cake, but methinks you missed something in the first one. That, or someone changed the spelling of "birthday" without telling me :). Ugh. I bought one of the puppy cupcakes for my kids from the grocery store. Covered in frosting, but the left the paper on the cupcake!!! My kid totally bit into it, and why wouldn't she? It was covered in frosting! 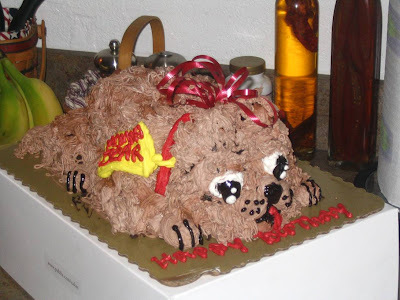 All in all, I thought it was the cake I'd least want to eat in the world...until I saw these poor, pathetic pups. Ugh! Horrible. Even if they were made better, do you really want to carve up a dog and eat it? It's icky. "Check back tomorrow"...as if it's possible not to check for a new post each day. I would much rather eat the wreck cakes because they do NOT look realistic like dogs. I would find it grusome to eat the realistic model dog. This isn't really specific, but a friend of mine introduced me to your blog and I LOVE IT! Now when I go grocery shopping I always make my way over to the bakery counter HOPING that there is some godawful tumor of a cake waiting to be photographed and emailed to you by me. Keep up the good work. It looks like he's been stuck by a porcupine! Oh, I can so see myself trying to replicate that original cake for my daughter, and ending up with one of the ones below! Ouch! I know, I'm reaching. So bad!! New to the blog - love it! I agree with other posters; the *original* cake is hideous enough, why would you even want to reproduce it? Maybe you need a new category: "Good" Cake Originals. (You could even include those "good" CCCs haha). In all honesty, these dog cakes are hard! I don't think I'm ready to do one yet. That being said, I KNOW I can't do one and would never agree to it to begin with. Maybe these bakeries need to learn the same. Somehow these wrecks make me feel so sad. I feel ashamed for whoever made them. :( Just... so... ugly!!! oh, my i laughed so hard this morning. what does that yellow tag say on that first pathetic doggie? "[something] Bear"? So before I finished reading and scrolled down, I thought the order form pooch was the wreck! I loooove the site..but today I am a little disappointed! I am a little skeptical that the first wreck really was ordered from that first poochy..the tag? on the cake says something bear! Plus the claws look a little bearish. what do you think? I think all three of them are pretty bad. The model isn't bad, but not something I'd want to hack into. The other two are just awful. After the first photo, I was afraid to scroll down. Actually hesitated. Then I remembered: I have a good strong drink at hand. Yes, the tag does say "Moma Bear", but that doesn't look like any bear I ever saw, any more than it looks like a dog. And I agree, eating a good or bad rendition of a dog doesn't seem appetizing to me. Wreck in concept and execution. I don't get anonymous @ 5:30, "disappointment" seems unwarranted. Those cakes are wrecks regardless of what the "model" was. Thanks, Jen, for the daily dose of humor! Shouldn't that read, "Yappy Birthday?" I think Tammy Faye Baker has been reincarnated as a Cake Wreck. That first wreck - what's up with the cutesy cartoon eyes? I think Guy #1 should have taken a leaf outta Guy #2's book and just done little black blobs for eyes. I'm kind of against the idea of cake being too realistic looking in the first place, which is why a semi-realistic dog does not appeal to me. But what gets me laughing is that the first "replica" was actually given to someone. Like, the person who ordered saw the original and they were expecting... not a pile of frosting oozing out of every conceivable shape... yikes. And what would the conversation have been like? "Yeah, I know you ordered this out of the picture book, but this is what it's really supposed to look like." Wow. Yet another fantastic entry! amazing what the orders translate into.. you're very funny, you make me laugh everytime! I am aware that I am a horrible, horrible person, but my first thought when I saw that first dog wreck was "Did someone throw up on the plate?" And now I have images from "A Child Called It" in my head. Thanks a lot. Aww poor doggies never had a chance, talk about aiming too high! How are you meant to make strands of dog hair out of icing?? This should only be attempted by black-belt bakers. Wow, these are just plain freaky! There isn't much cake I would turn down, but I'd have to draw the line here. EEEEWwwwwwwww! That's just creepy. I don't think I would be caught taking a bite of fido. What a horrible job they did too. Ugh. Great blog, I can't stop laughing at the oozing brain comment. I just had to come back and take a look at that first one again. I admire the way the decorator tried to capture the reality of the eyes with those two white dots. That was very conscientious! I don't know if this has already been said, but the "professional" one looks moldy. GREEN whisker spots? More like mold on refried beans. OK, that made me laugh out loud. I'm thinking it belongs in favorites. that is just so horrendous! Last Easter my uncle got a cake that was supposed to say Happy Easter ...but it came out Happy Eastes. Oh dear. I hope they didn't have to pay! The top one looks like one of those very bad fuzzy dog houseslippers they came out with several years ago. OMG - I got this cake for my daughter's 10th birthday. It looked NOTHING like the picture in the book. It was horrible. And mostly frosting and no cake. She loved it though. That first cake looks like the dog in The Fly II that got turned inside out... The second one looks as if it's recently been on fire! I can't imagine why a grocery store would use a picture of a cake that even a well-trained, experienced baker would have trouble duplicating. On the other hand, I don't know why anyone would order this cake from a grocery store (or ANY cake from a grocery store) and expect it to look like the picture. One time my Grandmother bought me & my sister an adorable dog cake. It was cute, but once we ate it, it turned out to be made mostly of a mini-pound cake and flavorless icing. It was delicious . LMAO.. ok those cakes are bad.. but i make those cakes all the time at weis they never look like those bottom examples.. lol they can be really cute.. I ask them what type of dog they want lol.